How do we create a personal ceremony? There are two ways that we can put together the ceremony. Visit the Planning page to view the two methods available. Do we have the final say over the wedding text? Yes. This is your wedding so it should reflect your wishes. I do try and keep my Address to the Couple the same in all my ceremonies. This section is my discussion with the bride and groom and contains specific information about marriage and what it takes to be successful long term. The address comes from my years of experience in counseling. Additionally, my practice participated in research about success in maintaining long term relationships and I want to share what I know with you. I will make some changes in this part of the ceremony but I want the overall message to remain. Do you have referrals from other couples we can see or contact? We try to protect the confidentiality of our clients. If it is very important for you to talk with someone, I’ll call someone who has given us a quote and ask if it is OK for you to call them. I’m sure I can find someone you can speak with. Will you honor our values and spiritual beliefs and help us express them? Yes, we offer personal wedding ceremonies that are designed to be a reflection of who you are and the statement that you want your wedding to make. Yes. We do weddings in churches and in many locations both inside and outdoors. 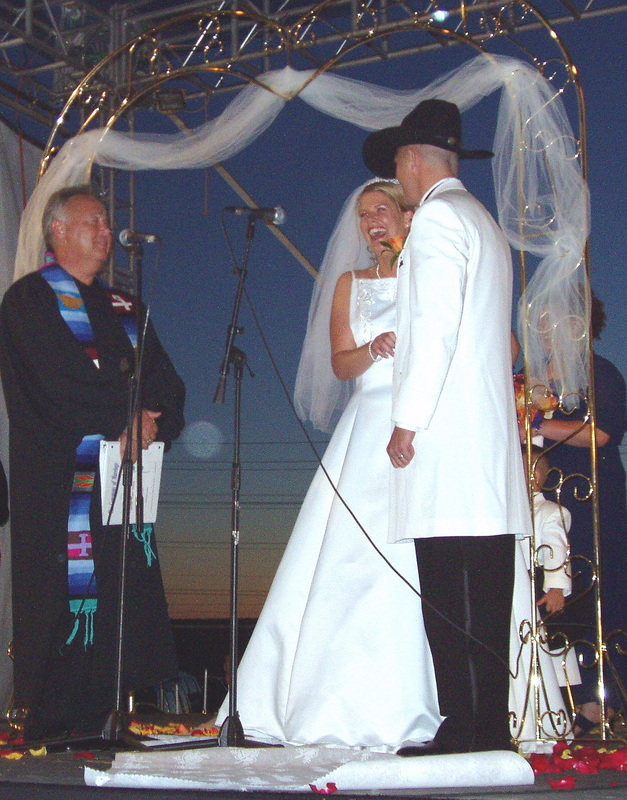 We can do ceremonies almost anywhere. Examples of alternative ceremony locations might include: The Jewell Box,Grand Basin or a picnic spot in Forest Park, a pavilion, Stupp Center or Piper Palm House in Tower Grove Park, Missouri Botanical Gardens, the Gateway Arch, churches, chapels (like Graham Chapel at Washington University,the Provincial Chapel at UMSL, or New Town Chapel in St. Charles) temple, synagogue, private homes, casinos, gardens, courthouse, hotels, country clubs, golf course, hall, pavilion, parks, museum, swimming pools, boats, banquet centers, bed and breakfasts, college and university chapels. Illinois - St. Clair County; Madison County, Louis and Clark Chapel; Jersey County, Pere Marquette State Park; Monroe County, Waterloo, Schorr Lake Winery. Weddings more than 15 miles (one way) from I-70 and MO 94 are subject to a travel charge. Will you officiate over a ceremony which mixes customs from people of different national origins, ethnicity or religion? Yes. The Spiritual Growth Fellowship doctrine recognizes that most of the world’s religions share many of the same basic tenets and we respect the rights of others to worship God in their own way. We have done many inter-faith weddings and have incorporated rituals from other cultures into our ceremonies. We have a library of such customs and rituals to draw upon in the construction of your service. May our friends or family participate in the service? Yes. We welcome participation of your family and friends doing readings etc. Our only request is that we have a copy of what they intend to do 30 days in advance. This prevents the guest and the minister using the same reading….yes it happened to me once. Also, we prepare a bound copy of the ceremony as a keepsake for the happy couple and we want to be sure to include the participation by your friend or family member. Can we vary the traditional choreography of the wedding? ​Yes. We often suggest changes ourselves so that the ceremony can more easily be seen and heard by family, friends and guests. Do you do theme weddings? “Oldies Wedding” created out of lyrics to oldies songs. All participants were costumed and this wedding was broadcast live on Juke Box 96. “Moody Blues Wedding” Most of the text of this ceremony came from the lyrics of music by the Moody Blues. We performed this wedding in front of 18,000 guests at a Moody Blues concert. Themed weddings tend to require more time in preparation so there may be an additional charge. Will you work with other wedding professionals? Yes. We regularly work with wedding planners, photographers, videographers, music providers and more. We prefer to work directly with the bride and groom in the planning of the ceremony. Why do you charge a retainer/deposit? Retainer: We do not finalize a wedding on our calendar and are free to book other wedding ceremonies on the date requested until a Retainer is paid and a signed contract is received. In paying the Retainer, you are paying a fee to reserve our services on your wedding day and time, with the remainder of the fees, ceremony performance , travel and incidentals to be paid (at a specified later date). Once we have received the retainer we will not book that day and time for others. Therefore the retainer is non-refundable. WedXpress $25, Beautiful Basics $50.00; Remembrance Custom Weddings $100 *please note: if you choose EZWED Elopement package in addition, please add $125 to the retainer fee. Does your fee include a rehearsal? No. Many of our clients do not wish to have a rehearsal so we charge a separate fee for the rehearsal. If everyone in your wedding rehearsal knows what to do they may not be necessary, but are useful in making sure everyone knows what to do and when, where they are supposed to stand, where the ceremony is and more. When do you arrive before the ceremony? If there is a rehearsal, I try to arrive about 15 minutes ahead of time. - For WedXpress and Beautiful Basics ceremonies I arrive 15-30 minutes prior to the wedding start time. - For Remembrance Custom Weddings, on a typical ceremony I schedule to be there about an hour ahead. That allows me to se up everything and take care of last minute details. Do you perform LBGTQ ceremonies? I'm considering one of my friends/relatives get ordained on-line and performing the ceremony. It will save money and it will be special because they are my friend/relative. ​First, the cost of a minister, officiate, justice of the peace, celebrant is almost always one of the least expensive wedding costs. At the ceremony all eyes and ears are on three people...the bride...The groom and...The officiant. During those critical moments of the ceremony is it a good decision to have someone who has never done a wedding to be in control of yours? Reverend Million was first ordained in 1994. He has been ordained as a Christian minister in Protestant, Catholic and Inter-Faith denominations. Study of the world’s major religions led Reverend Million to be awarded the Doctor of Divinity. Other certifications and degrees include B.J.S., R.Hy, P.D.M. and T.Th. Reverend Million attended colleges in Ohio, Maryland, California and Missouri, and has lectured extensively throughout the US. 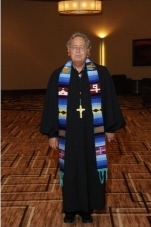 A Christian, Reverend Million has been recognized as a leader in the interfaith ministry movement. He serves as the Moderator for the international organization, the United Fellowship of Interfaith Ministers, which is made up of more than 300 ministries and churches of all the major (and many smaller) religions worldwide. In December 2010 he retired as Archbishop for 19 states*for the Holy Order of Saint Raphael, an Apostolic Orthodox (Catholic) order, with an ecumenical philosophy. His ordination as Archbishop is documented through the Roman Catholic and Russian Orthodox churches and can be traced to the Disciples of Christ. Additionally, Reverend Million was Bishop for the State of Missouri for the Church of Seven Planes, an inter-faith church and the 110 ministers of that denomination in this state. 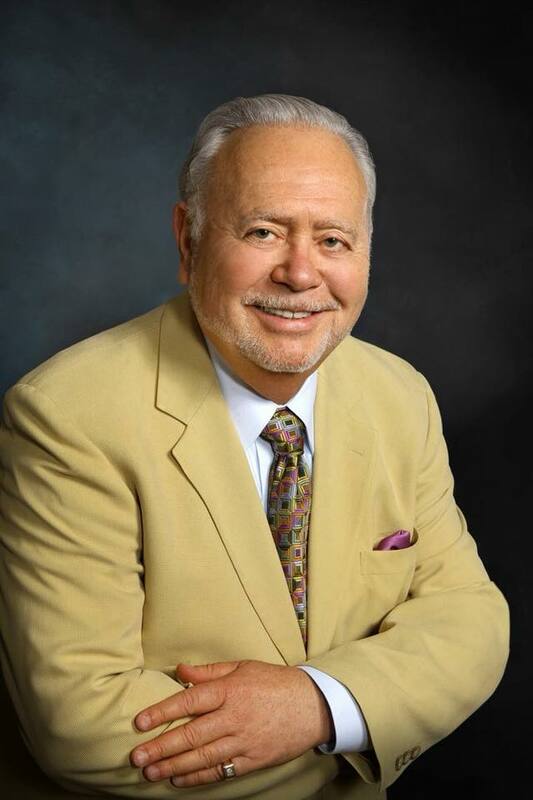 Dr. Million is currently, or has been a member of the American Association of Pastoral Counselors, American Association of Wedding Ministers, American Association of Wedding Officiates, Alpha Omega Fraternity of Ministers, Association for Humanistic Psychology, the National Association of Trans-personal Psychology and the International Association of Counselors and Therapists.